2006 - 2 song 7"
These songs were co-written with Michigan-based troubadour Andru Bemis. Andru tours the country by train and possesses one of the most beautiful and unique voices you will ever hear. About a year ago, Jason and Andru decided to try to write a handful of songs together. The result was a batch of tunes that bounce around somewhere between beautiful and silly - Simon and Garfunkel meets the Muppet Show. Only 1,111 numbered copies of this disc were made. 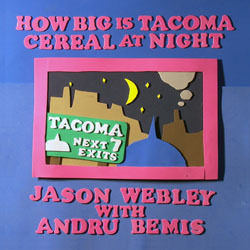 All songs (C)2006 by Jason Webley and Andru Bemis.